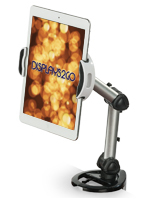 Do you need an iPad clamp mount for desk or tabletop use? We carry a selection of portable tablet mounting accessories designed for both stability and mobility. 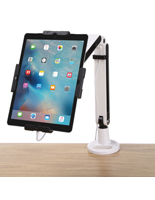 Simple, easy to move iPad clamp mounts, also known as portable tablet holders, can be attached to the edge of almost any surface and provide the perfect mount for Apple devices and Android tablets. These adjustable tablet brackets are specially designed for durability, stability and versatility in office, professional, school, and off-site event environments. iPad clamp mounts with gooseneck or extendable arms allow users to move the device stands to whichever position required for accessibility. This type of fixture is ideal for office, staff, and customer use. Podiums2go offers a variety of models, some with a fully locking design and some without, to accommodate the needs of any business or office. Multi-purpose commercial grade iPad clamp mounts, adjustable device displays can be used for working remotely, showcasing advertising or marketing materials, as presentation accessories, or even as interactive customer-facing kiosks. What are the different options for portable tablet holders? iPad clamp mounts with flexible goosenecks offer a full range of motion for installed devices. Portable tablet holders with articulating arms offer adjustable height and depth as well as standard tilt and rotation. Multi-device clamp mounts can be used with multiple Apple or Android tablets, laptops, notebooks, eReaders, and even monitors, creating fully functioning mobile workstations in almost any enfironment. Portable tablet holders are the perfect accessory for office or trade show settings to use for work or presentation purposes. The optional locking function makes several of the models the perfect option for business or retail settings. Secure yet movable tablet display stands allow customers to interact with digital sales, ads, specials or upcoming event information while keeping devices safe from theft or tampering. Easy to move clamp-style brackets are also a great choice for on-the-go travel purposes because they attach to lap trays on trains or airplanes, providing a secure work station in any environment. These tablet holders are not only affordable but also extremely practical. In any setting that a hands-free using experience may be desired, simply attach the clamp to a flat surface and display your tablet. The steel construction ensures that your device will be protected, safe and tamper-proof. In some models, the home button on the iPad or tablet is covered to further enhance security. If you have a business or home that operates on a multitude of brands of tablets, we have cases that will fit both Apple products and Android tablets. Find all the specific mounting and loading instructions on any of the products listed above. The open access to audio and charging ports ensures that use of your electronics will not be inhibited by the use of the clamp mounts. Order today at wholesale prices to make the most of your tabletop space and allow for a hands-free presentation!